Don’t like your smile? 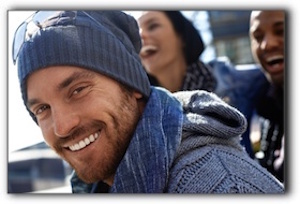 We invite you to consider cosmetic dentistry at Hales Parker Dentistry in Ladera Ranch. If you are not familiar with the latest advances in dental procedures, you might not realize what cosmetic and restorative dentistry can achieve. A total cosmetic dental smile makeover involves a combination of cosmetic dental procedures which may include dental crowns, porcelain veneers, tooth implants, teeth whitening and, in some cases, orthodontia. We provide several clear braces options, including Invisalign and Six Month Smiles. If you have dental anxiety, we can help. Sedation dentistry will calm your nerves and help you relax while you undergo your smile redesign. If you are in the Ladera Ranch Mission Viejo, Las Sorres, or San Juan Capistrano area and have cosmetic dentistry questions, give us a call to schedule a consultation. We also provide general and family dentistry.